Made from a very thin, breathable, soft and lightweight waterproof nylon material, they are not like the noisy, bulky pants from years gone by. They are very comfortable, slimline, with better leg and waist cuffs for added protection. 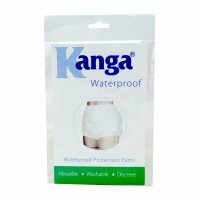 The exact material that Kanga Waterproof Pants use is Polyurethane coated and rest assured only the very highest quality waterproof pants use polyurethane coated nylon. The difference between this and the standard PVC type is incredible, you will never go back to standard PVC pants after trying these. Many people prefer not to wear any absorbent incontinence products, whether washable or disposable as they often find them uncomfortable to wear or worry that the product will show under clothing. The Kanga Waterproof Pants are so lightweight, thin and quiet that you can easily slip them on over your usual underwear and go about your normal day. Although the pants don’t offer any absorbent protection, the waterproof material should keep leaks contained until you have time to change.